When Does Life Begin? It’s Not So Simple. Fetal personhood bills are gaining steam—but many religious and scientific ethicists, as well as women, see the path to personhood as a gradual one. The belief underlying the Ohio measure, which never made it to the Senate floor, is that the heartbeat serves as final and irrefutable proof of the arrival of a unique human being, one who should be treated with the same respect and care as a person outside the womb. Since 2011, similar heartbeat ban bills have been proposed in 14 states, and one was proposed in the House of Representatives this past January. The laws passed in Arkansas and North Dakota, but both were ultimately blocked by federal courts. Supporters of these bills have embraced the ultrasound as offering scientific proof of their religious belief that life begins as early as conception. And with President Trump seeking to add justices to the Supreme Court who would overturn Roe v. Wade—which protects abortion rights up to the point of viability—these activists have new reason to be hopeful. Should a radically shifted court ever embrace the cause that’s become known as fetal personhood, abortion would be considered murder and outlawed nationwide. But despite the insistence of anti-abortion activists, the notion that life begins at the bright line of conception is at odds with many ethical traditions. 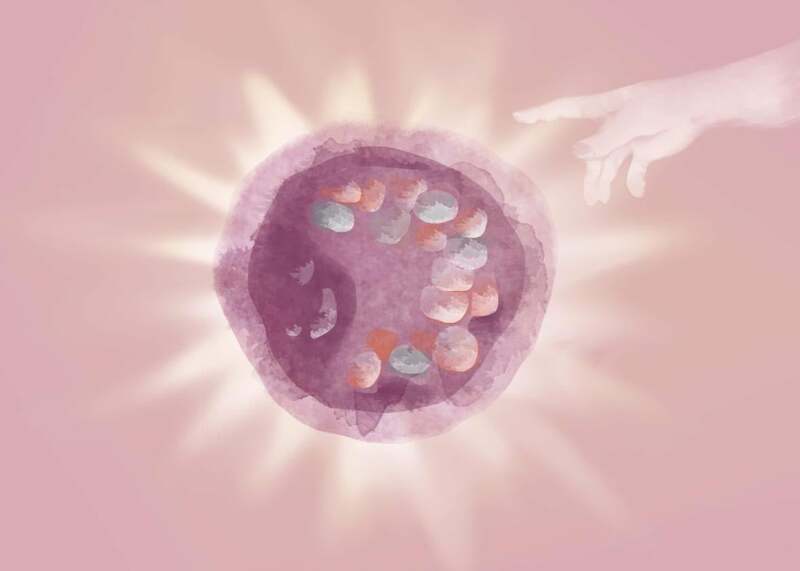 In a number of religions, when an embryo or fetus becomes a person remains a mystery, something that occurs not in a single moment but in a series of moments, none necessarily more important than the next. And, for all the anti-abortion side’s embrace of ultrasounds, the medical community tends to agree. “Many scientists would say they don’t know when life begins. There are a series of landmark moments,” said Arthur Caplan, professor and founding head of the Division of Medical Ethics at New York University Langone Medical Center. “The first is conception, the second is the development of the spine, the third the development of the brain, consciousness, and so on.” That perspective, it turns out, has deep roots. It’s also one that resonates for many pregnant women who experience the embryo’s gradual passage to personhood on a visceral level. The majority of Jews do not believe that life begins at conception but instead see the creation of life as something that happens over time. During this process, the fetus is seen as part of the mother, whose well-being, both immediate and future, takes precedence. As with other religious traditions, Jewish ethicists have increasingly become willing to consider psychological threats to the mother in addition to physical ones, when considering whether an abortion is the right decision. There are also a number of biblical passages in which the breath, and not the heartbeat, serves as the central symbol for life, including, most famously, Genesis 2:7: “Then the Lord God formed man of the dust of the ground, and breathed into his nostrils the breath of life; and man became a living soul.” Anti-abortion activists often counter these examples with two other biblical passages, both which suggest that some kind of ensoulment happens at conception. “Before I formed thee in the belly I knew thee, and before thou camest forth out of the womb I sanctified thee,” reads Jeremiah 1:5. Together, these passages suggest that the author or authors of the Bible were as uncertain as we are about when life begins. For many Christian ethicists, this ambivalence is reason to err on the side of caution and to assume we are ensouled from the very beginning. Sulmasy added that there is no real historical theological precedent for the recent focus on the heartbeat, which couldn’t have been heard until the stethoscope was invented in the 19th century. For much of its history, the church considered life to begin at the quickening, or the first time a woman feels the baby move, which usually happens sometime around 18 weeks. “[The focus on the heartbeat] is just a contemporary attempt to create some dividing line based on what we now know about biology,” he said. In light of this uncertainty, even among Christian factions, it’s striking that anti-choice activists have spent decades fighting to codify a fixed definition of when life begins into state and federal law. These efforts were given a boost by the passing of the Religious Freedom Restoration Act in 1993, which made it easier for opponents of abortion to argue that compromising those beliefs would be a violation of their freedom of religion. With Roe v. Wade already the law of the land, meanwhile, the voices of the religious pro-choice have largely been missing from the debate. As for the scientific community, Caplan believes that the relative silence from his peers on these issues is a product of professional fear. Many scientists rely on the government for funding and want to avoid alienating anyone with the power to shut down their research. “If scientists weren’t such cowards about getting into the abortion issue, they would be speaking up more about this,” Caplan said. In the debate over life’s beginnings, the heartbeat is a metaphor, a visceral and potent symbol of life that some can’t help but interpret as proof of life itself. It’s hard to be unmoved by the coursing of blood through an embryo or fetus’ heart, something many women and men now bear witness to in the exam room, with our eyes, ears, and, yes, hearts. Still, the heartbeat deceives. It renders the grayscale beginnings of life in black and white, in refutation of the fact that this is a mysterious process with many possible ends. Denying this doesn’t just threaten women’s reproductive rights, but also limits the way we think and talk about pregnancy, pregnancy loss, and childbirth. This mystery is what makes it possible for the same woman to choose an abortion and then grieve a miscarriage, or to pray for the survival of the 5-day-old embryo implanted in her womb by a fertility doctor while being at peace with the fact that, if that one makes it, the other half-dozen in the freezer will be destroyed. When we view life as evolving in stages, it frees us to experience all these moments in all their fullness and complexity. Last year I went through infertility treatment. This included one egg retrieval, during which doctors took 21 eggs out of my ovaries, 19 of which fertilized, 12 of which made it to the fifth day, and four of which were determined to be chromosomally viable through preimplantation genetic screening. The first egg doctors implanted in me made it to 6 weeks gestational age, and then I started bleeding. When I went into the doctor to figure out what was going on, I saw the heartbeat. Two days later, the heartbeat was gone. A few months later I was implanted with another egg, and I’m now nearing the end of my third trimester. Throughout all this, my husband and I struggled to boil down the mix of emotions and science to something our toddler son could digest, a formulation that wouldn’t hide our desire for another child while still acknowledging the precariousness and liminality of the whole undertaking. What worked for him is this: Mommy is trying to grow a baby. And when I got pregnant: Mommy is growing a baby. Describing it this way allowed him to understand two things: The creation of babies, of life, is a long, complicated, and often messy experience. Also, babies don’t magically appear but can only come into being with the assistance of the women who play host to them. It’s a simple formulation, one that ultimately helped us make sense of what was happening as well. And when, if, this baby I am growing takes his first breath, it will be a moment of awe for all parties involved. Finally, we will take comfort in what we see as the undeniable, palpable arrival of life: a new person, in the world.